My friend Nicholas Harper sent me this interesting account of a man's near-death experience. I found the account of Mellen-Thomas to be so interesting because many of his experiences aligned perfectly with my meditation experiences and the views of the nature of our world, and the cosmos around us. In particular I found two key themes that are absolutely consistent with experiences I have had, and information that I have learned from healers, mystics and books. One key theme is the way that the "Light" that he encountered helped him travel to other realms. The light took him through the Sun, and then through the black hole at the center of the galaxy to travel to other realms. This has been the same as my inner guidance and healing work has revealed. I'll quote Mellen-Thomas, because his account is beautiful. "I asked to see the rest of the Universe; beyond our solar system, beyond all human illusion. The Light then told me that I could go with the Stream. I did, and was carried Through the Light at the End of the Tunnel. I felt and heard a series of very soft sonic booms. What a rush!" "Suddenly I seemed to be rocketing away from the planet on this stream of Life. I saw the earth fly away. The solar system, in all its splendor, whizzed by and disappeared. At faster than light speed, I flew through the center of the galaxy, absorbing more knowledge as I went. I learned that this galaxy, and all of the Universe, is bursting with many different varieties of LIFE. I saw many worlds. The good news is that we are not alone in this Universe!" "As I rode this stream of consciousness through the center of the galaxy, the stream was expanding in awesome fractal waves of energy. The super clusters of galaxies with all their ancient wisdom flew by. At first I thought I was going somewhere; actually traveling. But then I realized that, as the stream was expanding, my own consciousness was also expanding to take in everything in the Universe! All creation passed by me. It was an unimaginable wonder! I truly was a Wonder Child; a babe in Wonderland!" "At this point, I found myself in a profound stillness, beyond all silence. I could see or perceive FOREVER, beyond Infinity." "I was in the Void." "I was in pre-creation, before the Big Bang. I had crossed over the beginning of time/the First Word/the First vibration. I was in the Eye of Creation. I felt as if I was touching the Face of God. It was not a religious feeling. Simply I was at one with Absolute Life and Consciousness." "Do you know what is on the other side of a Black Hole? We are; our galaxy, which has been reprocessed from another Universe. In its total energy configuration, the galaxy looked like a fantastic city of lights. All energy this side of the Big Bang is light. Every sub atom, atom, star, planet, even consciousness itself is made of light and has a frequency and/or particle. Light is living stuff. Everything is made of light, even stones. So everything is alive. Everything is made from the Light of God; everything is very intelligent." "As I rode the stream on and on, I could eventually see a huge Light coming. I knew it was the First Light; the higher Self Light Matrix of our solar system. Then the entire solar system appeared in the Light, accompanied by one of those velvet booms." "I could see all the energy that this solar system generates, and it is an incredible light show! I could hear the Music of the Spheres. Our solar system, as do all celestial bodies, generates a unique matrix of light, sound and vibratory energies. Advanced civilizations from other star systems can spot life as we know it in the universe by the vibratory or energy matrix imprint. It is child’s play. The earth’s Wonder child (human beings) make an abundance of sound right now, like children playing in the backyard of the universe." The first one is the "grid of light"
"We all have a higher Self, or an oversoul part of our being. It revealed itself to me in its truest energy form. 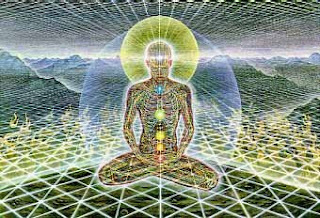 The only way I can really describe it is that the being of the higher Self is more like a conduit. It did not look like that, but it is a direct connection to the Source that each and every one of us has. We are directly connected to the Source. So the Light was showing me the higher Self matrix. I was not committed to one particular religion. So that is what was being fed back to me during my life after death experience." "Then the Light turned into the most beautiful thing that I have ever seen: a mandala of human souls on this planet. Now I came to this with my negative view of what was happening on the planet. So as I asked the Light to keep clarifying for me, I saw in this magnificent mandala how beautiful we all are in our essence, our core. We are the most beautiful creations." "The human soul, the human matrix that we all make together is absolutely fantastic, elegant, exotic, everything. I just cannot say enough about how it changed my opinion of human beings in that instant. I said, “Oh, God, I did not know how beautiful we are.” At any level, high or low, in whatever shape you are in, you are the most beautiful creation, you are." "The revelations coming from the Light and seemed to go on and on, then I asked the Light, “Does this mean that Mankind will be saved?” Then, like a trumpet blast with a shower of spiraling lights, the Great Light spoke, saying, “Remember this and never forget; you save, redeem and heal yourself. You always have. You always will. You were created with the power to do so from before the beginning of the world.”"
Read his entire account here.